Note: Yogurt/curds should be thick & should not contain water. You can also use red food colour. Wash & cut chicken into small pieces. Squeeze out water from chicken. Dice onion, tomato & capsicum. Note: remove seeds from tomato. In a bowl add all marinate ingredients mix well. Taste it & adjust the seasoning. Add chicken, onion, tomato & capsicum, mix well. Refrigerate it for 2-4hrs (Preferably 4hrs). Note: If you are using wooden skewers soak it in water for 20min. 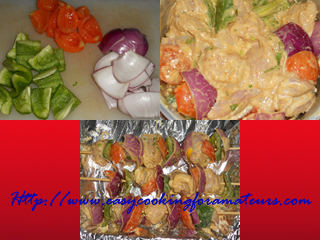 In to a skewer put 1 to 2 piece of chicken then 1 piece of tomato, capsicum & onion. Repeat this till the end of skewer. Repeat same to other skewers. Cover the tray with double layer of aluminum foil to avoid the baking tray from oil stains. Place the skewers on the tray. Note: Skewers ends should be kept on the sides of the tray so that there should be gap between tray base & the chicken pieces. Preheat the oven for 10min to maximum temperature. Place the tray in oven. After 15min remove the tray, turn the chicken to other side & brush some oil on top. Put it back to oven near to top coil. Let it cook for another 15min or till it gets brown spots & dry. Remove it to the plate & serve hot with lemon wedges & onion rings. If you don’t have oven you can cook it on the non-stick griddle/ tava. Place pieces on hot griddle. Cook one side for 2-3 min before turning to other side. Cook both sides till it’s cooked completely. Also fry vegetables in the same way. Chicken tikka is ready to serve with lemon wedges & onion rings. Note:You can also grill this on barbeque grill. 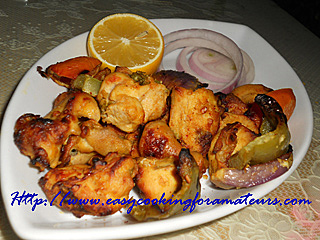 Chicken tikkas looks incredible and yummy..
Looks fabulous..perfectly cooked and aromatic chicken. 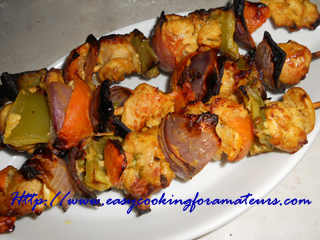 they are perfectly done...love chicken tikka kabobs! First time here, nice space! Chicken tikka is really inviting! awesome tikka..will surely give it a try ! I am saving this recipe. It is a perfect recipe to use on our barbecue grill. YUMMO. I think this one is going on the menu for tonight. First time here, and in love with your chicken tikka. Truely delicious. Will come back to check out more of your creations.